Oh. My. God. 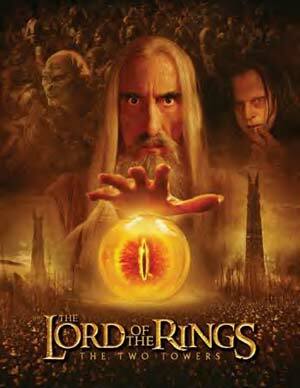 If you thought The Fellowship of the Ring was good, all I can say is you ain't seen nothing yet. The Two Towers is twice as action-packed, twice as exciting and involving and, er, not as full of boring elves. The story sees the gallant Fellowship split into three: while Sam (Sean Astin) and Frodo (Elijah Wood) trek towards Mordor and Mount Doom, Aragorn (the lovely Viggo Mortensen), Legolas (the lovely Orlando Bloom) and Gimli (the not so lovely but wonderfully comic John Rhys-Davis) are hot on the trail of the scary Uruk Hai, who have captured Merry (Dominic Monaghan) and Pippin (Billy Boyd) and look set to eat them for dinner. Fortunately the plucky wee hobbits escape, only to run into a dark and twisted forest straight out of every Jungian fairy tale, where they encounter a huge walking Ent called Treebeard (superbly voiced by John Rhys-Davis, although one has to ask why Brian Blessed wasn't called in for this one.). Meanwhile, Theoden King of Rohan (Bernard Hill) has fallen under the influence of Saruman (the ever fantasic Christopher Lee, who sadly isn't in the film as much as he should be) and the superbly slimy Grima Wurmtongue (Brad Dourif in an Oscar-worthy performance of unctuous evil) and only Gandalf (Ian McKellan) can save him. but Gandalf's dead, I hear you cry. Oh no he isn't! Yup, the plot certainly hasn't got any less fantastic, or complicated. And yet the acting is so convincing and the scenery and special effects so jaw-droppingly amazing (except for some rather dodgy tree sequences, but Treebeard is so utterly loveable that you easily forgive this) that you don't find any difficulty in losing yourself completely in the Middle Earth world. Whilst Frodo and Sam are slightly sidelined in this instalment of the trilogy, characters such as Gimli, Merry and Pippin at last get a chance to shine, whilst Aragorn proves himself a strong and credible hero, with sidekick Legolas (an extremely dull character in the book I always thought - his only strong point seemed to be his ability to see a long way) a dashing foil to his darker, moodier companion. Face it, everyone in this film is great, even Liv Tyler, but top marks have to go to the CGI- animated Golum, the tormented underground creature driven mad by the Ring of Power, whose schizophrenic antics are at times repulsive, at others almost cute. Brilliantly voiced by Andy Serkis, he is so real and interacts with the other characters so flawlessly it's hard to believe he's only a 21st century cartoon. Tolkien purists may complain that Peter Jackson has played fast and loose with the original plot but for those of us who are simply there for the spine-tingling, heart-racing, tear-jerking adventure (oh, and the rather yummy men. did I say that?) will not be disappointed. An epic masterpiece! A timeless classic in the making! Etc! Etc! Well, that was my reaction to the film when it came out at the cinema last year, but what about the extended version? With over 40 minutes extra footage (taking the running time up to a whopping four hours!) there's plenty to keep you on your toes here, and to explain certain slight inconsistencies in the screenplay. In particular, flashback scenes to Gondor featuring the ever manly Sean Bean as Boromir go a long way to explain his character's fatal obsession with the Ring in the first film, and also why Jackson has the lovely Faramir take Frodo, Sam and the Ring back to Gondor, a scene which had Tolkein anoraks spitting into their mead. Further revelations as to the true nature of Aragorn are also enlightening - and hey, Viggo even gets to lighten up and be funny at one point! The only scene I felt was rightly excluded from the original version was an early Golum moment in which he reveals his schizophrenic personality - in my opinion far too soon, reducing the impact of the fantastic 'Go away! I'm not listening!' scene later on.